As usual without any planning and all guns blazing we visited Sagargad fort. You can start from Khandale Village which is 4 km before Alibag easy to spot the sign board your are at Khandale Village. Take left or ask for direction till Dhondane Waterfall the path is well marked with steps leading you till Siddheshwar Ashram. You can enjoy the waterfall and visit the Ashram for quick refill of water. Till here our trek was on Schedule and Monsoon was on our side rains and cool breeze.The place is thickly forested which was surprising and visibility is limited to certain distance. We reached Sagargad Machi / Wadi (Village at base). We asked an local for direction he pointed us correctly though we missed some turn or went in wrong direction and got lost. Word of advice stick on the right side of the plateau from there you can see the fort and walk towards it using basic direction skills. After 1 1/2 hr of walking we decided to reach an higher point to check the fort location. Luckily we found it and walked towards it through an thick forest growth patch. We could see an path which is well laid out with marking an board for direction this path is used by locals for grazing livestock a family is living near the fort. There were many goats and cattle grazing on the slope near the fort. We were relieved at reaching Sagargad. It has some amazing views of Alibag and Mountains on the other side. We entered the fort which is very small and completely taken over by trees. We walked through it till we reached the Plateau. We could see Alibag till the factories at Vadkal Naka. We had our lunch and took some pictures of the Vanartok Pinnacle and Takmak tok. You can explore the Bastion and Shivling and Ganesh Temple which is inside the fort marked by an orange flag. We started our journey back till Khandale and took the laid out route we reached till the plateau quickly here we decided to take the other route which ends at Bamangaon this route is very steep and you have to walk near the edge for almost 70 % of the time. There is no place on the fort to stay overnight. One can stay in the Siddheshwar temple or at the school in Sagargad Machi. There is a community center at the Khandale village where overnight stay is possible.There is no facility for food on the fort. Packed lunch is necessary.Potable water is available on the fort. Pen is nearest railway station. Khandale village is situated on the Mumbai-Alibaug road. While travelling to Alibaug, one can reach Khandale village after crossing Karla pass. The village is about 4 miles from Alibaug. Since the road to the foot of Sagargad is unpaved, we can reach there by car except in monsoon. After crossing a small stream here, one has to climb up on stairs built in rocks. After about half an hour the path splits 2 ways. The way right takes us to a point where we can see beautiful the Dhondane falls. And the way to right takes us to the fort top. There is another road to the fort from Poinad village via Wagholi. 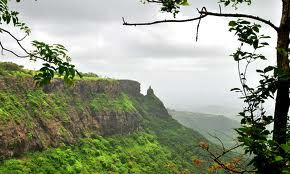 Poinad is situated on the Mumbai-Alibaug road before the Karla pass. There is another path to the fort from the village Vadavali. 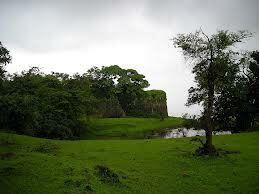 The way to reach the fort is through Khandale village situated on Mumbai-Alibaug road.. The way to the fort is an unpaved path which is on the left side of the road towards Alibaug. The path to the fort is marked trail and takes 2 hours to reach the top. On the way to the fort, one can see ' Dhondane ' falls in monsoon. 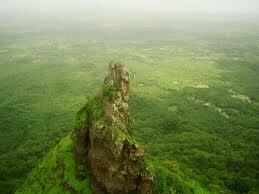 Right above this fall is the Siddheshwar Temple and an old monastery. 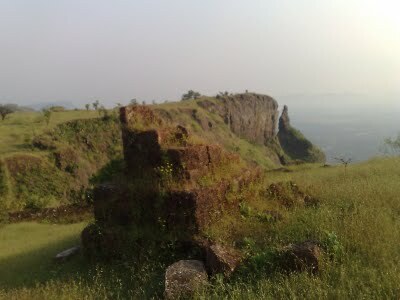 Main entrance of Sagargad is in dilapidated state. Sagargad has a peculiar ' Y-shape ' if seen from aerial view. On the left side of the fork of this ' Y ' is a tall peak called ' Vanartok '. Sagargad is fortified by 4 m tall walls, and the citadel inside is strengthened by 5 bastions. There is a moat near the eastern ramparts which is now defunct. There is a secret door here. We can enter the citadel by climbing over this wall. There is a small temple here which comprises idols of Lord Ganesh and Mahishasurmardini Devi (Goddess Durga), and a Shivalinga. There is a small tank near the temple which is fed from spring water source through a snout called Gomukh or Mouth of a Cow. The fork on the fort starts at some distance from the tank. On the right limb is a tomb with a woman's hand carved on it. This is called " Saticha Mal " and is dedicated to a Sati. On the left limb are the remnants of the rest houses.